Is Beta important for investing in stocks? There are many different strategies and investment styles you can use for investing in stocks, with different market conditions requiring different investment approaches. For example, one investor’s view of what constitutes a “safe haven” or a defensive investment will differ from another’s. Different investors will also have different views on how best to maximise profit, or on what constitutes investment break-even. Beta analysis is one criterion for investment. Beta measures the volatility of a stock or a portfolio, or its systematic risk, in comparison to the wider market as a whole. It is used in the capital asset pricing model (CAPM), which calculates the expected return of an asset based on its Beta and expected market returns. This is used, for example, in DCF (discounted cash flow) valuations. A Beta of less than 1 indicates the security is less volatile than the market overall, while greater than 1 indicates higher volatility than the market. For example, if a stock's Beta is 1.2, it is theoretically 20% more volatile than the market. Beta analysis – Risky or safe? With economic ups and downs, or fluctuations in oil prices or currencies, it is difficult for any investor to analyse risk. However, factors like Beta, a company’s fundamentals, or its stock price performance relative to a stock’s industry sector, or relative to a broader index, can assist investors to minimize their risk. 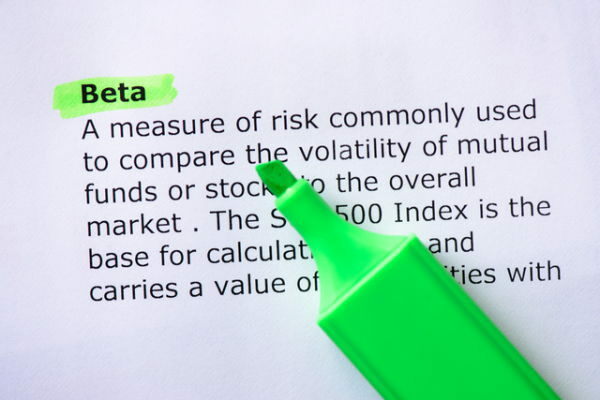 Beta is one factor connected with stock price risk, but it has limits for those investors who are more interested in fundamental risk factors. High-Beta stocks are supposedly riskier, but have the potential to generate higher returns; low-Beta stocks are lower risk but also (in theory) lower return. Beta is a quantifiable measure which gives investors a bit of clarity on the likely characteristics of a company’s share price performance and helps them to analyse risk factors better. Variations in Beta depend on factors like the broader market index used in the analysis and the time period measured. On the other hand, Beta analysis has its own shortcomings. Importantly, Beta does not take account of new information or incorporate any new risk factors which are not already known about. Also, a singles stock’s Beta is volatile and can change over time. Thus for short term traders, Beta is a reasonably good risk metric, while for long-term investors it is less useful. Baidu, Inc. (NASDAQ: BIDU), an American Depository Receipt listed on the U.S. Stock Exchange, is a Chinese-language Internet search provider, providing Chinese-language internet search services. The company currently trades at a Beta of 2.25, compared to competitors, such as Sohu.com Inc (NASDAQ: SOHU) at 1.90 and SINA Corp (NASDAQ: SINA) at 1.63. A Beta in excess of 1 for both stocks indicates that the industry overall is higher risk. However, the fact that Baidu has the highest Beta suggests that on a short–term view it is a marginally more risky stock than its peers. For example, Baidu’s current investment in its O2O business (Online to offline) is negatively impacting margins and putting downward pressure on earnings, meaning for example that forward earnings guidance has been below investor expectations. This in turn has affected short-term share price performance. Thus Baidu shares have been more volatile relative to the market, and this is reflected in their higher Beta. If, however, this investment were to pay off in due course, then a higher Beta would imply that, with enhanced growth prospects, the stock could outperform relative to the market over the longer term.